The Egyptians were particularly religious people obsessed by death and their preoccupation with the after life was to create the perfect harmony they found in the Egyptian living environment. In general it was believed that the best existence of man after life is composed of what was thought as the best and the most desired style of life on earth. We are very fortunate for the even, dry climate of modern Egypt. Tombs have survived in remarkable conditions despite the ravages of time and looters. 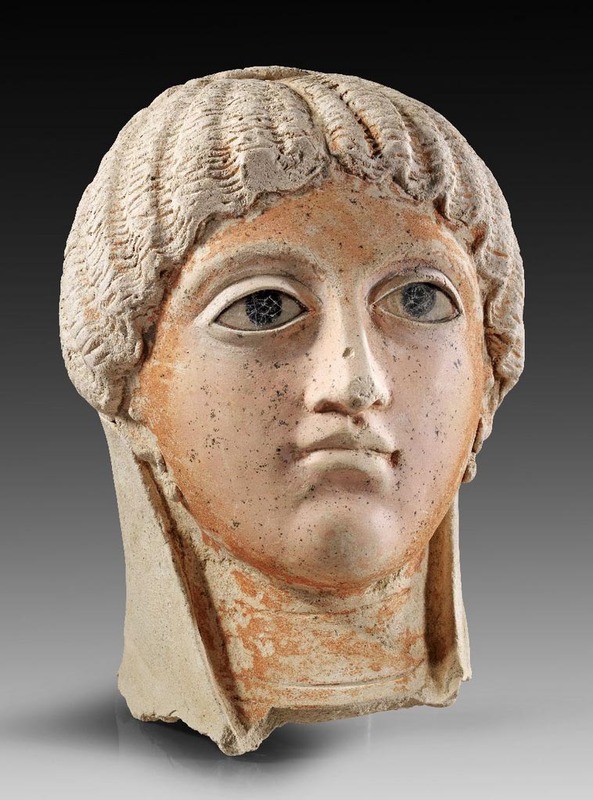 We can now admire and collect wonderful Egyptian decorative arts and funerary objects. In stone, bronze, wood, ceramic and faience, we have sculpture, jewelry, furniture, and used ritual pieces. The wonder and magic of the Ancient Egyptians lives on forever. By 2600 BC early embalming was set into place for the elite, royal families and the highest noble families, where the organs were removed through an incision in the body and placed in simple canopic jars, which in turn were placed into a chest. They used natural chemicals, natron to do their work. By the late Old Kingdom, bodies were placed in linens and gesso and decorated. The preservation and journey into the next life was very critical to the eternal life they sought so proper funeral equipment had to be produced. In the First Intermediate Period already, versions of spells once only held for Pharaohs, began to appear on wealthy patrons coffins. Animals are also mummified to accompany the deceased; the dog was sacred to Anubis, the cat was worshiped at Bubastis as the Goddess Bastet. At Saqqara and Hermopolis, ibis mummies filled the catacombs; In Fayum it was the crocodile to honor Sobek in religious devotion. The art of embalming was at its height in the New Kingdom, especially among Royal burials. The routine was to remove the brain from the scull by breaking the nose and whipping up the cerebral matter with a hooked instrument. The skull was left empty or filled with resins. The internal organs were removed and placed in ornate Canopic jars to represent the Four Sons of Horus and their protective powers. The liver and gall-bladder by the human headed god Imsety. The heart was left inside the body. It was considered very important, representing intelligence in life, and would be needed in the afterlife. There was a great deal of magic involved with the journey to the afterlife. The goddess Maat, symbolic for truth and justice was often present at the weighting of the Heart in front of Osiris. If the heart did not weigh up to Maat, the afterlife could not be attained. The heart is often covered with a winged heart scarab to protect it. A wealthy Egyptian man would prepare for his death while he was still in the prime of his life. He would need a tomb cut, coffins fashioned and decorated, a sled to take him, Statues representing Osiris and principal deities and workers, offering steala, papyri scrolls with spells such as, ’The Book of the Dead’, toilet equipment, food, and what ever else life’s comforts you afforded, like furniture and linens would be buried. As if caught in time to be preserved and secreted. These sought after and collected talismans or charms were believed to endow the wearer with magical powers or protection. Due to the size and the often vivid colors, they were also personal adornment during life. They did however, have important meaning in a funerary context. They were wrapped in with the body in mummy bandages and would also provide protection in the journey and into the afterlife. Amulets were generally made of faience, a composition frit, and then glazed in blue, green, yellow and turquoise. They also appear in semi-precious stones, gold, silver and even bronze. Gods & Goddesses, often depicted with animal headed were important icons to have been produced. We find: Amon of Thebes or Amen- Re of Heliopolis, Min, Imhotep, Khonsu, Iah, Osiris, the Egyptian god of the underworld, father to Horus, the god of sky, and protector of the dead, Isis who was the wife of Osiris and mother of Horus, and was worshipped as the archetypal wife and mother and she is often shown nursing a child on her lap, The Child Horus, her son, Harpokrates, The watchful Horus shown as a falcon-headed man, Sekhmet as a lioness headed woman, Bastet as well, Maat, seated crouched with a feather of truth on her head, Nefertum, Ptah of Memphis, creator god, Hathor, Mut, Neith, Nekhbet, Thoth, Ra Horakhty, Anubis as a jackal and Sobek as a crocodile, Thoeris, Nut, Pataikos, Bes, Tawert, The Theban triad was composed of Amon- Re and Mut as his consort with Khonsu as their child. The rock cut chambers would have false doors, seals, beams and passageways which would have to be guarded and sealed, but first decorated. Depending on the budget, the whole chamber would be inscribed with pastoral scenes, agricultural and butchery scenes, as well as invocations and presentation scenes and inscriptions. Funerary cones, long slender nails of clay impressed at the round head with hieroglyphics were represented at the ends of roof support beams, and were inserted in rows (their flat ends facing outward) above the mud brick entrances of tombs. They have titles and names under the reigns of Pharaohs. Offering vessels in clay and stone, cosmetic tools, tiles and implements, household items, furniture, wood models, have survived well in the burial chambers. Each antiquity whether it be a ring, or a seal, or a scarab, or a fragment is fresh and a marvelous reminder of these mystical people. Egyptian Wood Ptah-Sokar Osiris is a wooden figure depicting the god of resurrection, Ptah-Sokar-Osiris. The god is normally standing on a long rectangular base and has his hands across chest and wears a tightly fitting mummiform garment and nice tripartite wig. The body went into a well crafted coffin with lots of broad surfaces for decoration. Many whole coffins and panels remain. The case could be gessoes and overlaid with prayers and vignettes for aid from the Book of the Dead. The body was wrapped in bandages, set in and then, in later periods, gesso which hardened was encased and molded over. The gesso was then painted and decorated with garments, hands, jewelry, faces. 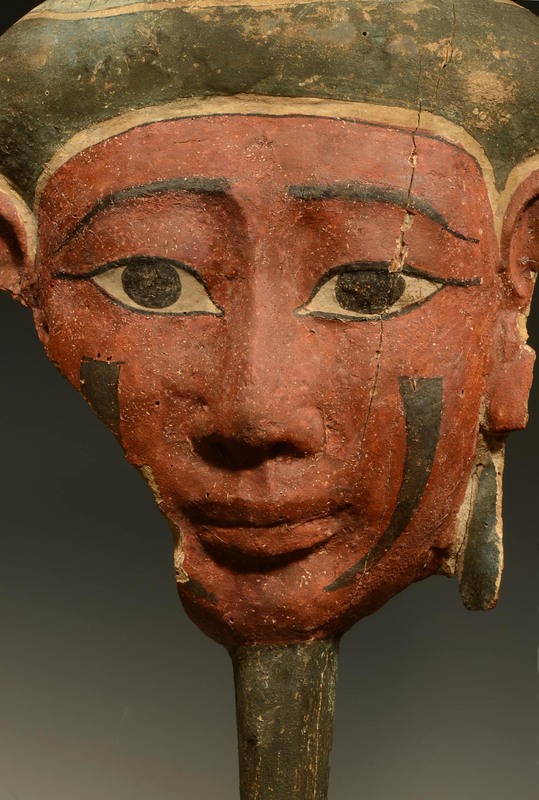 Egyptian coffin masks are sublime and brilliant and are of an idealized magical beauty with symmetrical almond eyes, and lips. Often inlaid with stones and cosmetic lines. They are usually done in wood and stone. The inner wood Panel is often painted with the protector Goddess Amentit, She stands with a perched Horus falcon headdress and arms in a protective gesture. She is a goddess who occasionally takes the place of Mut at Thebes, and she was a feminine form of Amun. Nice hard stone offering tables are found. From the New Kingdom especially to the Twenty Sixth Dynasty, Ca. 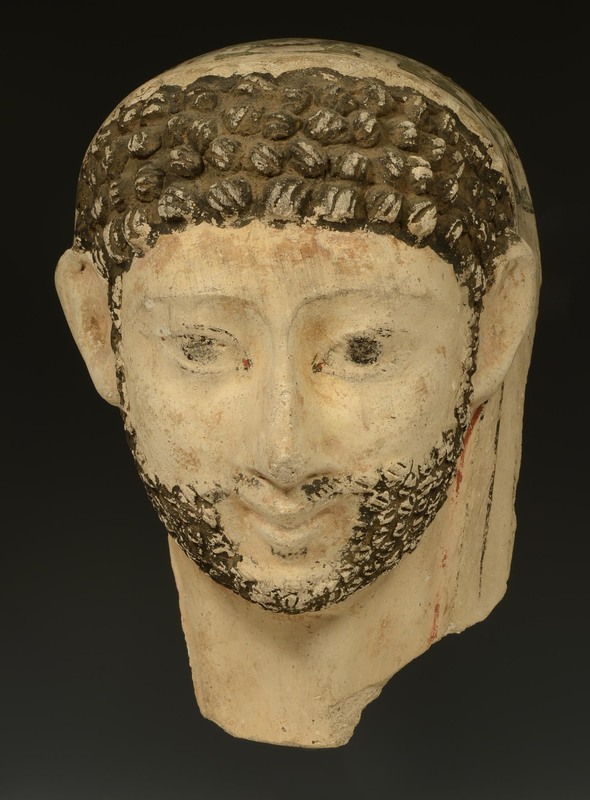 626 to 525 BC we find excellent carved wood Gods and Goddesses in Wood, stone and bronze. A Concise Dictionary of Egyptian Archeology by M. Bodrick, Phd. F.R.G.S. The Egyptian Mummy: Secrets and Science, edited by Stuart Fleming, Bernard Fishman. University Museum Publications. Mummies & Magic: The Funerary Arts of Ancient Egypt, D'Auria, Sue; Lacovara, Peter; Roehring, Catharine H. Museum of Fine Arts Boston, 1988.